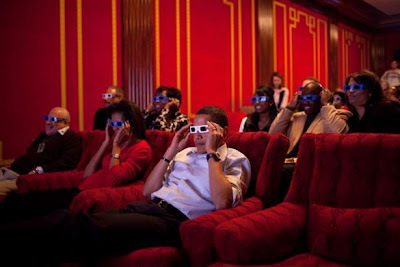 President Obama and first lady Michelle wear 3-D glasses while watching the Super Bowl with family, friends, staff members and members of Congress in the family theater of the White House, February 1, 2009. 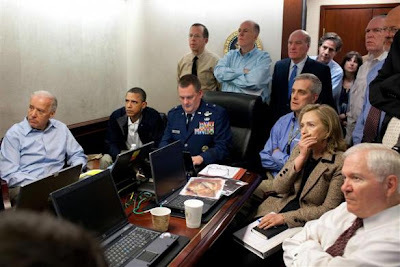 President Obama and Vice President Joe Biden, along with members of the national security team, receive an update on the mission against Osama bin Laden in the Situation Room of the White House, May 1, 2011. President Obama is helped by then Vermont Governor Jim Douglas to move a couch in the Oval Office, February 2, 2009. 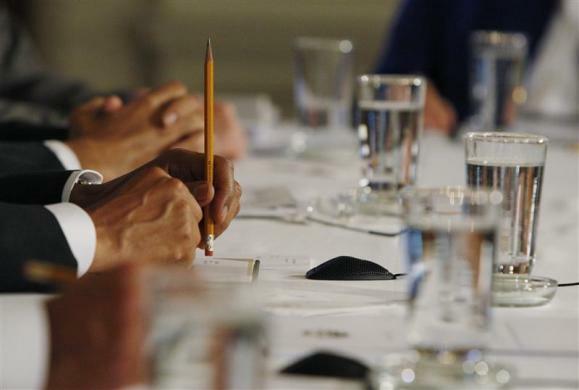 President Obama holds a pencil as he participates in a cabinet meeting in the State Dining Room of the White House, June 8, 2009. 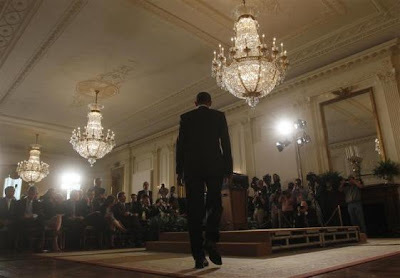 President Obama arrives for a news conference in the East Room of the White House, June 29, 2011. 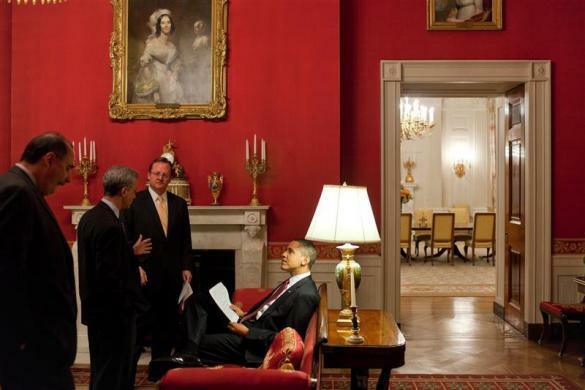 President Obama with Senior Advisor David Axelrod, Chief of Staff Rahm Emanuel and Press Secretary Robert Gibbs in the White House Red Room, March 24, 2009. 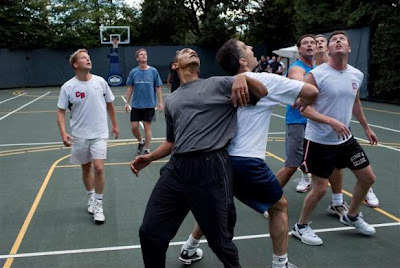 President Obama, along with Cabinet Secretaries and Members of Congress, during a basketball game on the White House court, October 8, 2009. 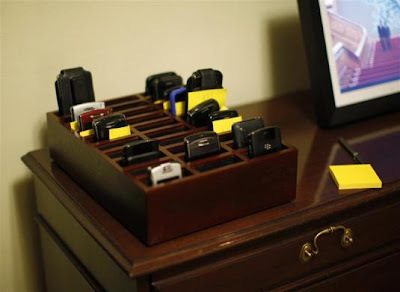 Blackberry phones belonging to senior members of President Obama's cabinet just outside the Cabinet Room of the White House during a meeting, August 3, 2011. 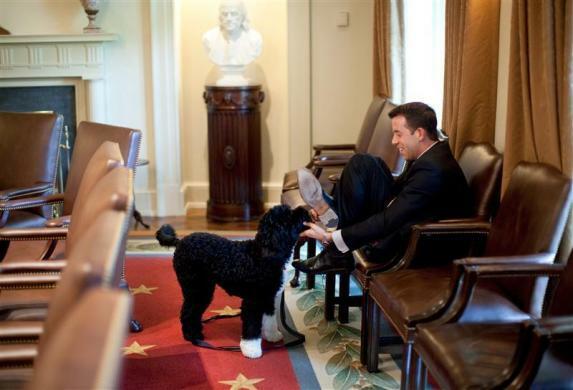 White House Deputy Director of Oval Office Operations Brian Mosteller attempts to protect his shoes as he plays with the Obama family dog "Bo"in the White HousCabinet Room, April 21, 2009. 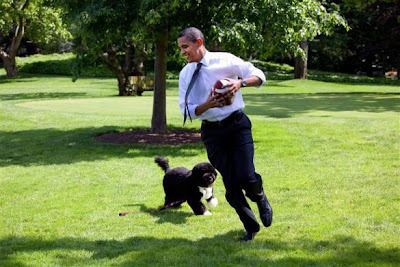 President Obama is photographed playing football on the South Lawn of the White House with the family dog Bo, May 12, 2009. 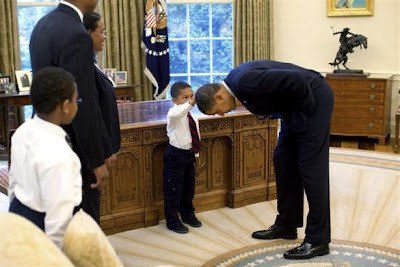 President Obama bends over so that the son of a White House staff member can pat his head during a family visit to the Oval Office, May 8, 2009. 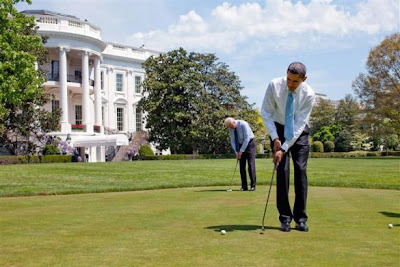 President Obama and Vice President Joe Biden practice their putting on the putting green on the South Lawn, April 24, 2009. 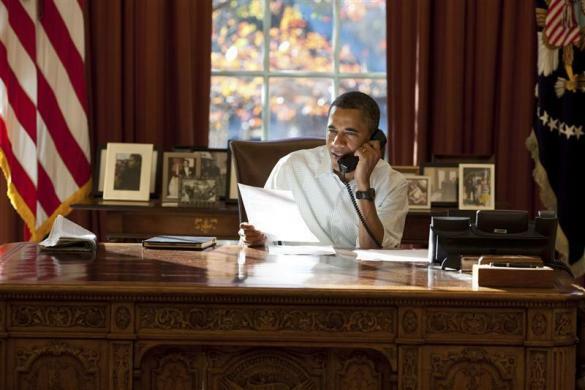 President Obama makes Thanksgiving Day phone calls to U.S. military personnel from the Oval Office, November 24, 2011. 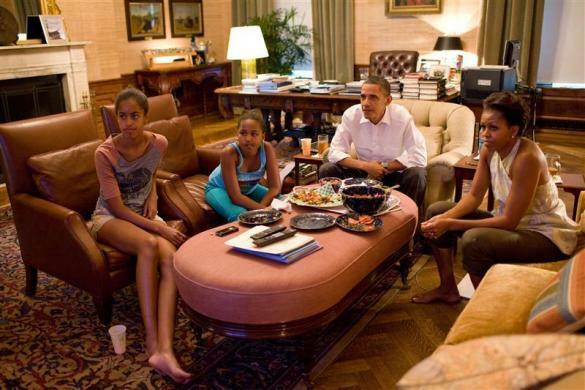 President Obama, first lady Michelle and their daughters Sasha and Malia watch the World Cup final between the U.S. and Japan, from the Treaty Room office in the White House, July 17, 2011. 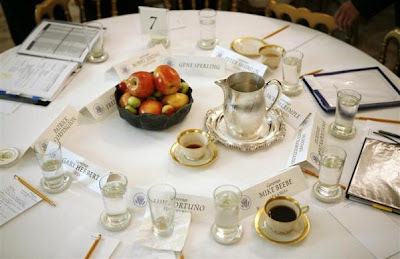 A table in the State Dining Room is seen before President Obama spoke with a bipartisan group of governors at the White House, February 28, 2011. 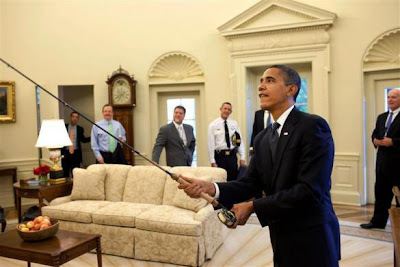 President Obama tries out the fly fishing rod given to him on his birthday by a group of avid fisherman on his staff in the Oval Office, August 4, 2009. 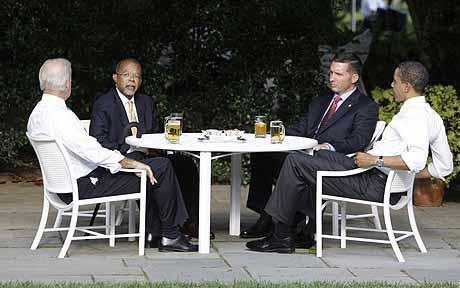 Barack Obama and Joe Biden have a beer Henry Louis Gates Jr., second from left, police Sgt. 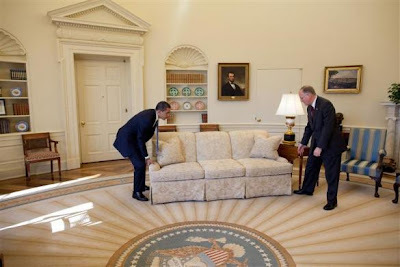 James Crowley in The White House. President Obama met with leukemia-stricken Jasmina Anema at the White House Dec. 3 2009. 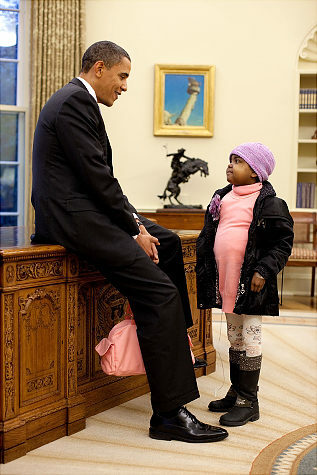 This 6-year-old New York City girl died from a rare form of leukemia just weeks after she met the President.